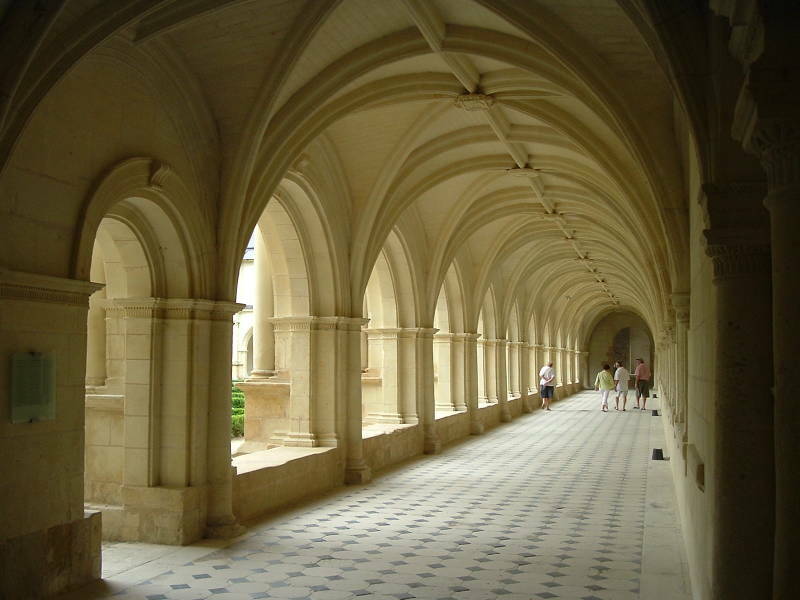 The Abbey of Our Lady of Fontevraud is a former Benedictine abbey founded in 1101. 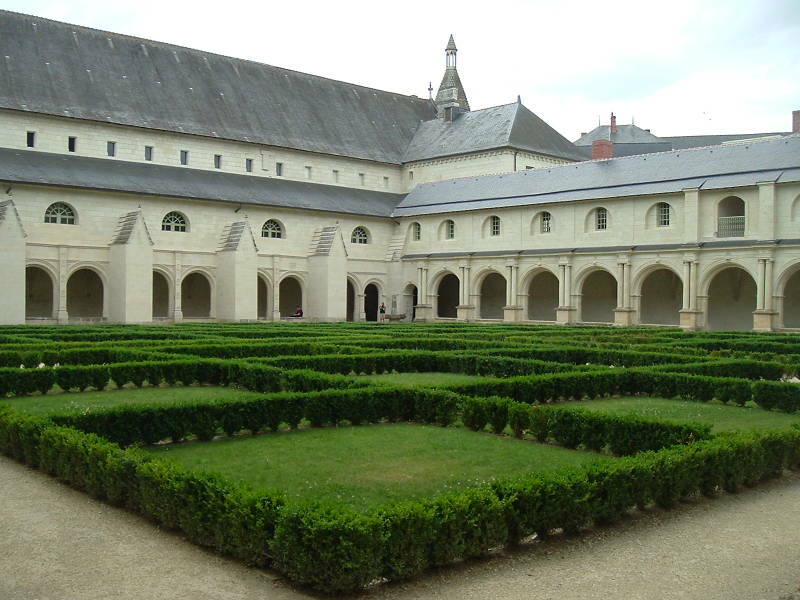 This is one of the largest monastic complexes in Europe. This was originally a mixed monastery with both men and women in the same buildings. It was later expanded into multiple monasteries with the sexes segregated. The Counts of Anjou protected it from the beginning as it was in their territory. Then the Plantagenet dynasty that ruled England and half of France supported it, with prominent members buried in the main abbey church. The French Revolution shut down religious establishments including this one. It was converted into a prison, and operated as such until 1963. The complex is built from the soft limestone underlying the region. The stone was quarried nearby. 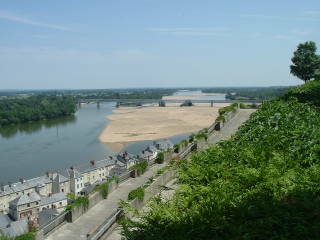 Pope Urban II visited Angers in 1096 and appointed Robert Arbrissel, a monk and hermit, to a mission position in this area. Robert traveled from settlement to settlement, establishing a large following of men and women from various social classes. 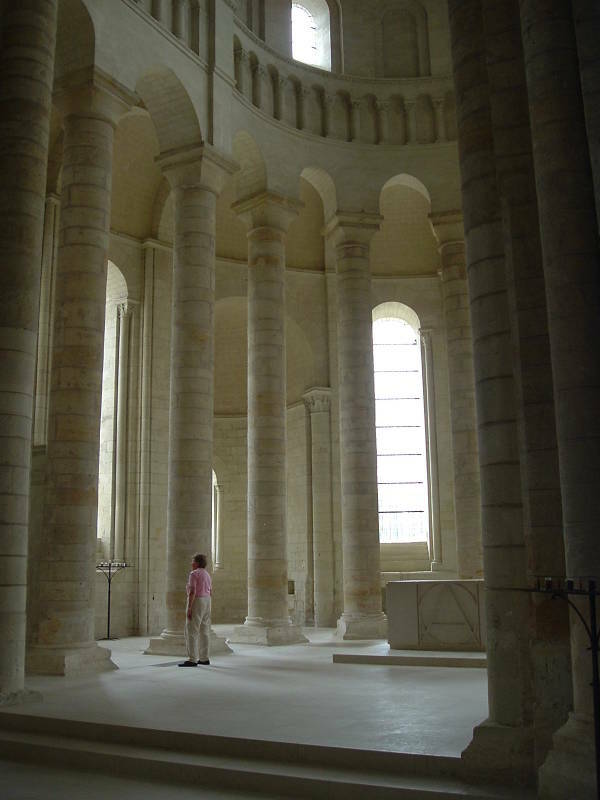 He founded the Abbey of Fontevraud in 1099-1101, mixing men and women in violation of the usual rules. There was a hermitic practice of συνείσακτοι or syneisaktisme, an ascetic practice of chaste cohabitation intended to overcome carnal desire. It came from the Desert Fathers and was more common in Celtic monasticism than in continental Europe, with Robert's group the most prominent European example. They even slept together. Robert made a point of only sleeping with the former prostitutes, not the noble women, at least most of the time. Pope Gregory VII had initiated a series of reforms during his 1073-1085 papacy. 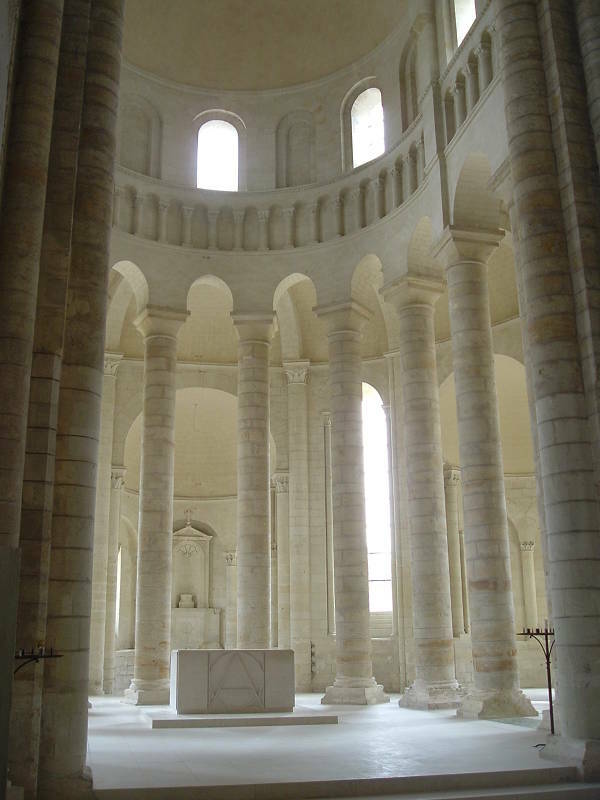 Those reforms reached Fontevraud's co-ed abbey around 1100 and put an end to their syneisaktisme practice. 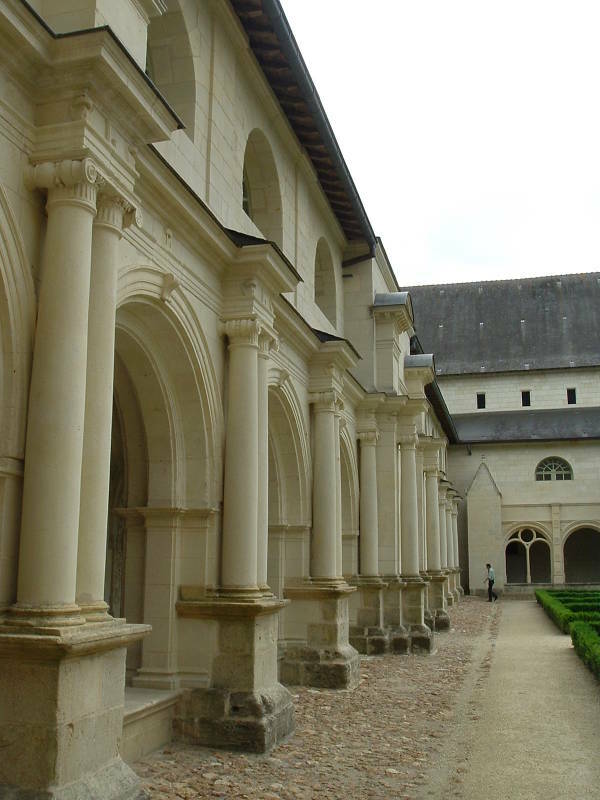 In 1101 the mixed house was split into a double order: the Monastery Saint-Jean-de-Habit for the men and the Monastery of the Grand Moûtier for the women. They soon created two more organizations: the Monastery of the Madeleine for repentant sinners and the Saint-Lazare Convent for Lepers. Since we're all sinners and we should all be repentant, I suspect the Monastery of the Madeleine specialized in Robert's former sleeping partners. 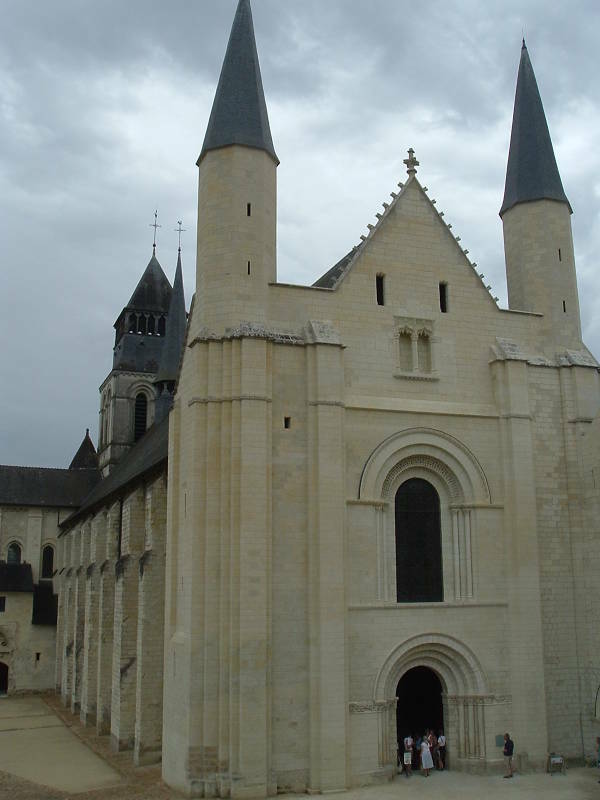 The changes led to the bishop of Poitiers and Pope Pascal II recognizing the order of Fontevraud in 1106. What is the difference between an Abbey and a Monastery? Abbeys and monasteries are similar religious organizations. A simple explanation is that "monastery" is the general term, and an abbey is a monastery of higher ecclesiastic rank. A monastery is a building or cluster of buildings containing the workplaces and housing of people following a religious way of life we call monasticism. That term comes from the Greek μοναχός, derived from μόνος, meaning alone. These could be men or women, monks or nuns, who have removed themselves from the secular world, and they might be Christian, Buddhist, Hindu, or Jain. They might live in a tight-knit community, or they might be isolated hermits. A monastery, at least in Christianity, might be an abbey under the rule of an abbot or abbess, or a priory under the rule of a prior or prioress (at lower rank than the abbot or abbess of an abbey), or a hermitage which is the dwelling of an individual hermit or anchorite or anchoress, derived from the Greek ἀναχωρέω, in turn from the ancient ἀναχωρητής. 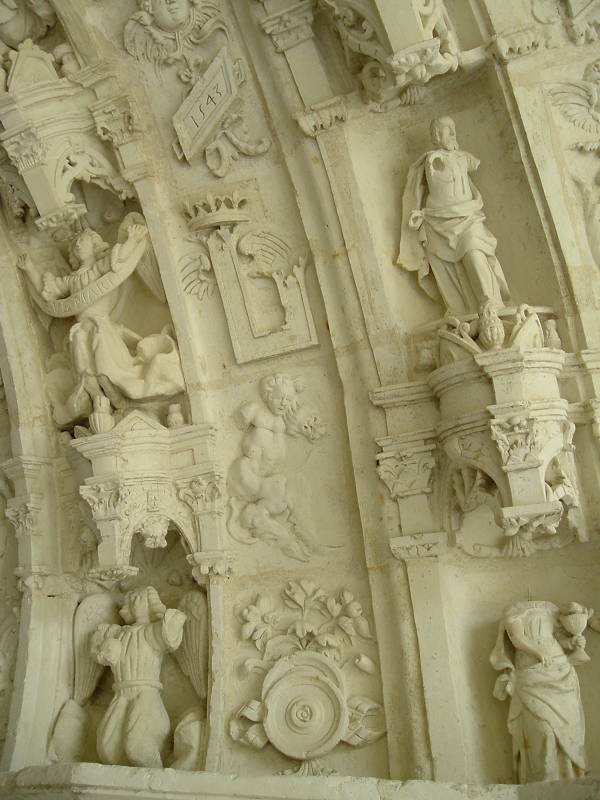 By 1200 Fontevraud supported a hundred priories throughout France, and later expanded into Spain and England. Eleanor of Aquitaine inherited the Duchy of Aquitaine, almost the southwestern quarter of today's France, from her father in 1137. Three months later, she married King Louis VII of France. The two soon left on the Second Crusade, the first to be led by actual Kings. Louis VII led the French forces, and Conrad III led the Germans. Eleanor's uncle Raymond was Prince of the Crusader Kingdom of Antioch and he was looking for protection. Eleanor went to Vézelay, one of the purported locations of Mary Magdelaine's grave, to organize supporters. She recruited some of her royal ladies-in-waiting and 300 non-noble Aquitainian vassals, and insisted on accompanying the army. It was as if Manuel I Komnenos anticipated the Fourth Crusade of 1202-1204, when an army called up by Pope Innocent III got only as far as Constantinople. The Crusaders decided that the city's inhabitants weren't really Christian, or at least that their being Orthodox instead of Roman meant that the army should just sack Constantinople and split up the Christian Byzantine Empire between their factions. It took the Byzantines until 1261 to regain control of Constantinople, and the Byzantine Empire and eastern Christianity never really recovered. The French and German armies took separate paths through central and eastern Europe. "Let's split up, we can do more damage that way." Manuel I Komnenos, the Byzantine Emperor, hindered the progress of the western European armies through Byzantine-controlled eastern Europe. Louis and Eleanor had a grand time in Constantinople. They stayed for three weeks, attending feasts and seeing the many sights. Meanwhile the German army continued across Asia Minor toward Antioch. Eventually it was time to get the French army back on the march. The Byzantine Emperor told them that Conrad's German army had achieved a great victory against the Turkish forces. He may have told them that in order to get them out of town quicker. Louis and Eleanor had just reached Nicaea, not far from Constantinople at the eastern end of the Sea of Marmara, when Conrad and the battered survivors of the German army staggered into camp with a gruesome story of their defeat. The French, joined by some surviving German forces, continued into Asia Minor. They got as far as Ephesus before being attacked by a small Turkish detachment on what happened to be Christmas Eve. The French slaughtered those Turks and took over their camp. Louis decided to cross the Phrygian Mountains heading roughly toward Olimpos in order to take a more direct route to Antioch. 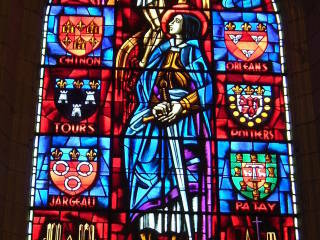 Eleanor marched in the vanguard, the point group led by her Aquitainian vassal Geoffrey de Rancon. Louis decided to take charge of the rear of the column, with the unarmed pilgrims and baggage trains. This was as far as the Germans had reached, and the French army was marching past unburied bodies of the recently massacred German army. Eleanor and the lead groups of the army crossed the highest point at Κάδμος or Mount Cadmus, known to the Turks as Baba Dağı. Then the Turks attacked the rear groups, both the armed groups toward the rear and the unarmed pilgrims and baggage and Louis at the very rear. The Turkish attack took the French by surprise. The body count was high. Louis had dressed in a pilgrim's tunic instead of royal garb, so while his bodyguards' limbs were severed and skulls smashed, Louis managed to escape notice and survive. He reportedly "nimbly and bravely climbed a rock by making use of some tree roots which God had provided for his safety." Eleanor was indirectly blamed for the disaster — her vassal Goeffrey de Rancon had made the decision to continue up and over the divide. As a non-noble, he was a convenient fall guy. Eleanor was further blamed for the size of the baggage train, and for the fact that her Aquitainian forces were marching at the front of the army and not toward the rear where the attack happened. The army split. Royalty and upper nobility retreated to the coast and sailed to Antioch while the soldiers and commoners continued marching across Asia Minor. Things became tense once they arrived in Antioch. Eleanor's uncle Raymond, prince of the Crusader Kingdom of Antioch, pressured Louis to attack the Muslim army in Aleppo. That made the most military sense and it supported the Pope's objective of retaking Edessa, but Louis was much more interested in making a pilgrimage to Jerusalem. Eleanor was fed up with Louis and wanted to stay in Antioch. Sure, they had had some good times — marching across Europe, being fêted in Constantinople, the excitement in Asia Minor — but she wanted out of the marriage. She brought up the issue of the consanguinity between her and Louis. They were too closely related. Third cousins once removed, both descended from Robert II of France. That invalidated a marriage in medieval Europe. Now Louis was the one who had had too much. He forcibly dragged Eleanor on to Jerusalem along with what remained of his army. Louis got his pilgrimage to Jerusalem. He later organized some military support from Conrad and King Baldwin III of Jerusalem and tried an attack on Damascus. This violated a truce between the rulers of Jerusalem and Damascus and ended in failure. Louis and Eleanor sailed for France in separate ships. Their ships were attacked by Byzantine ships acting under orders of the Byzantine Emperor. Maybe they had left some bills unpaid in Constantinople. The attack and following storms separated the ships, with Eleanor's driven south to the Barbary Coast. When she arrived in Sicily two months later, she found that she and Louis had both been presumed dead. King Roger II of Sicily gave her food and board, and then Louis's ship eventually arrived. This may have come as a disappointment. They stopped in Italy on their way to Marseille in order to get a divorce from Pope Eugene III, but he proclaimed that their marriage was legal. He had a special bed prepared for them, and told them to get into it and get down to business. Eleanor became pregnant, the Pope said "Problem solved! ", and they sailed for Marseille and France. To Louis' frustration, the result was only a second daughter. That was the end of it for Louis. He rounded up the Archbishops of Sens, Bordeaux, Rouens, and Reims and got the approval of the Pope. "Oh, you meant third cousin? Here's an annulment." Eight weeks later, in May 1152, Eleanor married again. Anjou was a county, a region ruled by a man ranked as Count in the hierarchy of European nobility. It was centered around the city of Angers in the lower Loire river valley, south of Normandy and lying between Paris and Brittany. Henry of Anjou was the Count of Anjou. Henry married Eleanor almost as soon as her marriage to Louis was annulled. They were even more closely related, being third cousins and both descended from Robert II, but neither was looking to get out of this marriage. At least not yet. 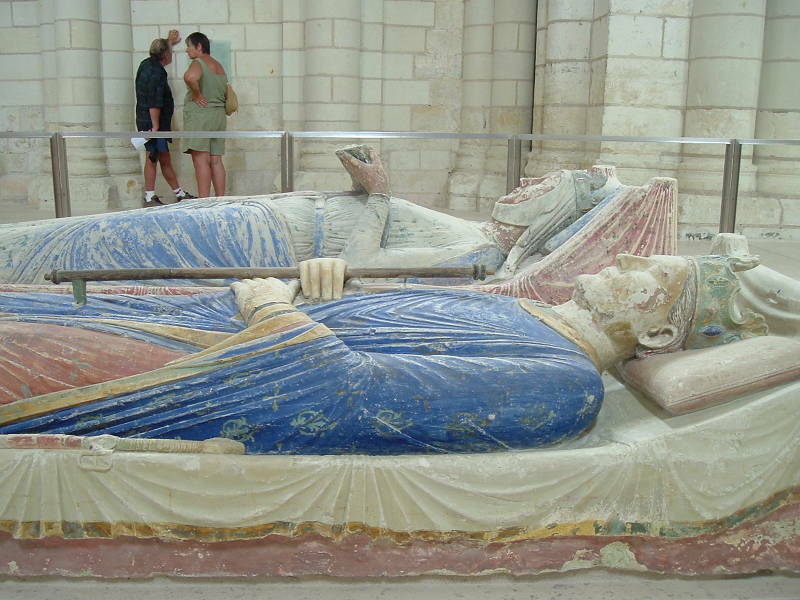 With Anjou and Aquitaine, the couple now controlled the southwestern quarter to third of what today is France. They controlled more of France than any ruler since the Carolingians, Charlesmagne and his dynasty. Meanwhile the King of France only controlled the Île-de-France region surrounding Paris, and his "control" of that depended on the cooperation of the various nobility really running things at the local level. The next year, 1154, Henry, Count of Anjou and husband of Eleanor of Aquitaine, also inherited control of the Duchy of Normandy and the throne of England. He became the English King Henry II. About half of the territory of today's France was now controlled by the newly-crowned King of England. 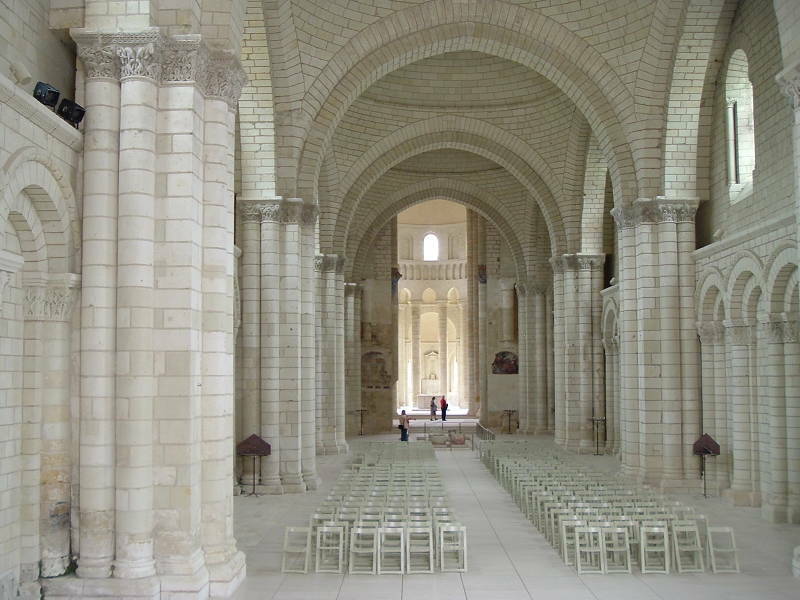 Henry and Eleanor first visited Fontevraud in 1154. They put their two children Jeanne and John, the future king of England, in the care of the monastery. The rapid rise to power is the good news. But otherwise, things never went well for Henry II. Squabbling within his family led to multiple armed rebellions. He fathered eight children by Eleanor and several more by mistresses, and he and Eleanor argued frequently about more than just the mistresses. Chosen heirs died of dysentery and tournament accidents. Henry appointed his friend Thomas Beckett as Archbishop of Canterbury, but then Thomas didn't remain a compliant puppet. Henry muttered something about "Who will rid me of this troublesome priest" and then four knights promptly killed Thomas. Or at least Henry said something along those lines. The awkward part was that he was muttering about Thomas and four knights took that as an assassination tasking. Finally, he had Eleanor subjected to what we would call "house arrest" today, imprisoned in a series of royal castles for the last sixteen years of Henry's life. The total structure is 90 meters long, and the transept crossing is 23 meters high. The nave is topped with four domes 10 meters in diameter. 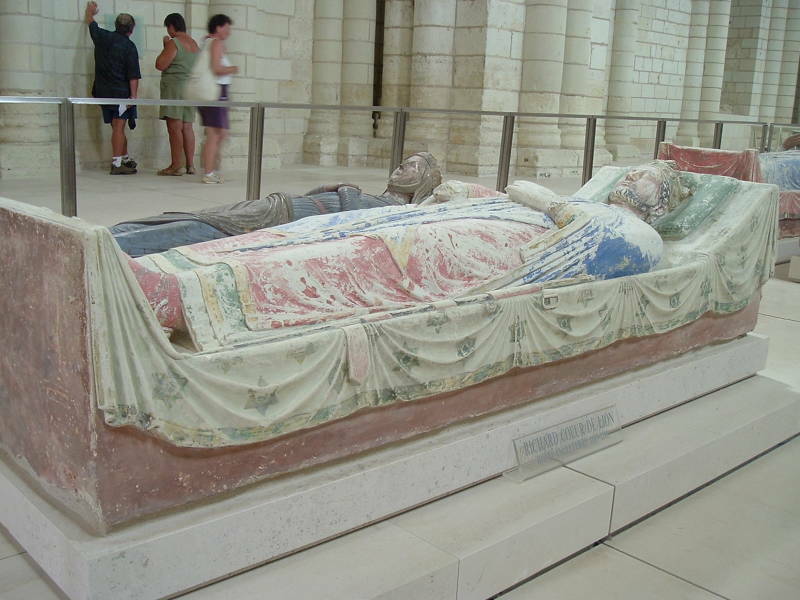 Henry II died in Chinon in 1189, physically and morally exhausted by fighting one of his sons and the King of France. Not just arguing, but actual military action. He had asked to be buried in Grandmont in the Limousin, but he died in the summer and no one wanted to try to transport his body that distance through the summer heat. Fontevraud made a convenient burial place. Henry's third son Richard, known as Richard Cœur de Lion or Richard Lionheart, was crowned as his successor. As a third son he hadn't been expected to rule, but those rebellions and tournament accidents had bumped him up in the queue. Like the ultimate American country music figure, his first act was to release his mother Eleanor from prison. Once crowned as King of England, he probably spent no more than six months in England. He started by riding off on the Third Crusade. The point was to recapture the Holy Land from the forces of Ṣalāḥ ad-Dīn Yūsuf ibn Ayyūb, known as Saladin in the west, but Richard found more to do. He massacred 2,600 prisoners at Acre, deposed the King of Cyprus and sold the entire island, insulted a number of other royal leaders, and apparently arranged for the assassination in 1192 of Conrad of Montferrat, the King of Jerusalem and ruler of the Crusader States. Richard had planned to become the King of Jerusalem once Conrad was out of the way, but that didn't work out. Then, traveling in disguise on his way home from the Crusades, Richard was captured and imprisoned by Leopold V of Austria. Leopold was Conrad's cousin, and Richard had already insulted Leopold and refused to share his spoils from the Crusade. That might have been why Richard was traveling in disguise. Leopold handed Richard Lionheart over to Henry the Lion, the Duke of Saxony and Duke of Bavaria. Leopold probably figured that two guys named Lion-something deserved each other's company. Henry the Lion got in touch with England. Richard's brother John had taken over Richard's unattended English holdings and let Normandy fall to Phillip II of France. Richard's ransom would cost 150,000 Marks. John imposed a 25% tax on goods and income to raise the money. This made him even less popular in England than he already was. John's pettiness and cruelty was the basis of the legend of Robin Hood. John raised the ransom, Henry the Lion released Richard Lionheart, and Richard briefly returned to England. He got back in charge of affairs in England, forgave John, and soon left England in 1194 for what would be the last time. Over the next five years, 1194-1199, King Richard Lionheart of England fought King Phillip II of France for control of Normandy. 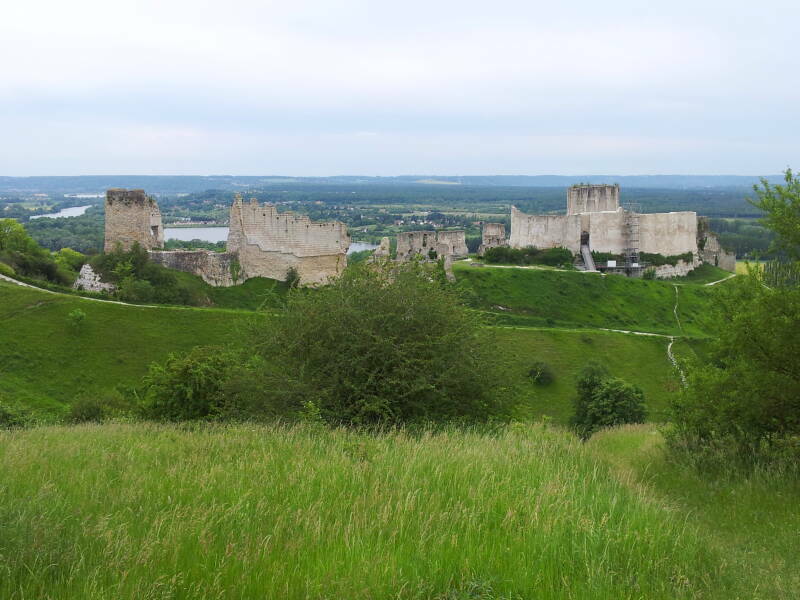 Château Gaillard on the Seine above Les Andely was Richard's largest military architecture project and his favorite residence. 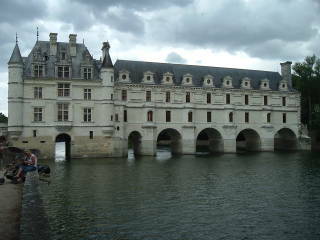 It's thought that Richard applied design ideas he had picked up from castles he had seen in Syria during the Crusades. Château Gaillard overlooking the Seine at Les Andelys. Then Richard Lionheart died in 1199 at Chalus-Chabrol. 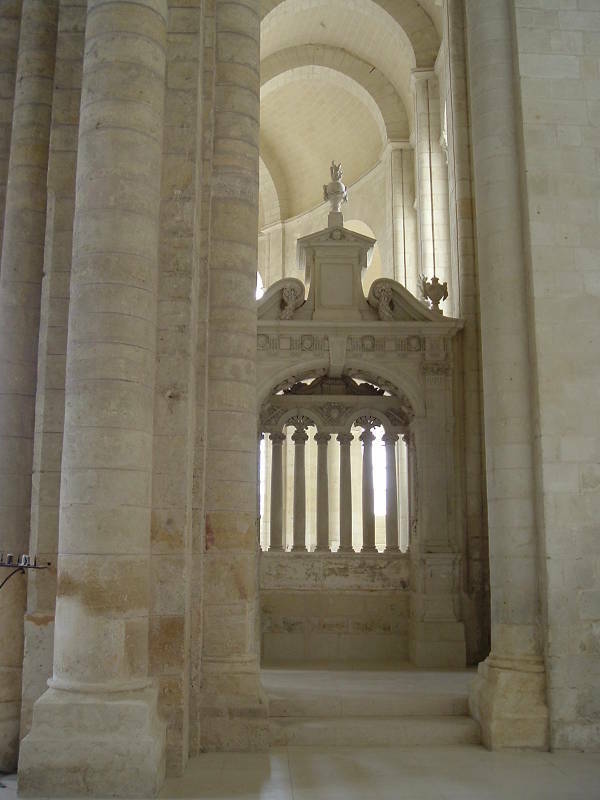 Eleanor had his body brought here to Fontevraud for burial. Well, most of it, anyway. His heart is buried in Rouen and his lower digestive tract in Châlus, where he died. 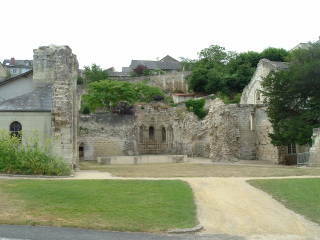 Then Richard's sister Jeanne died here later that year, and Eleanor had her buried in the abbey church. 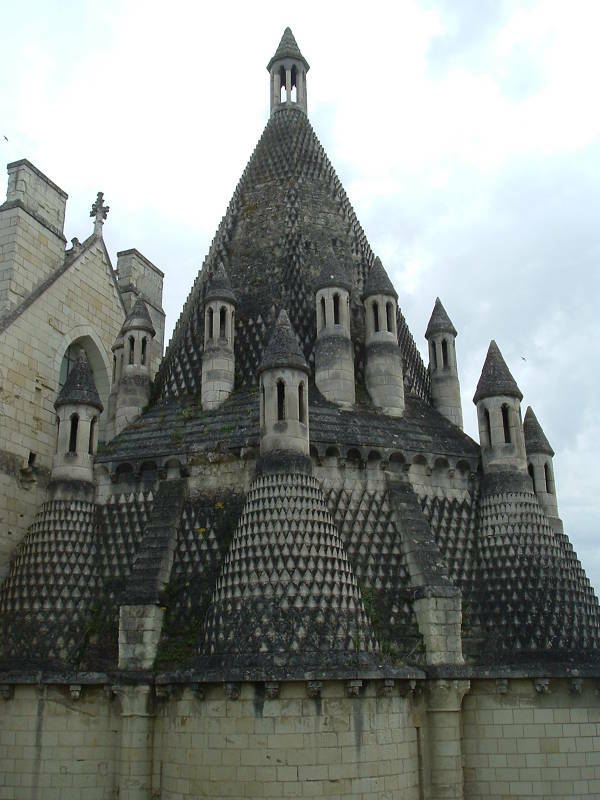 At this point there began to be talk that the Plantagenet family was trying to create a "dynastic necropolis" in Fontevraud to exert a sense of possession over their ancestral lands including Poitou and Aquitaine. Eleanor moved about 80 kilometers south to Poitou. 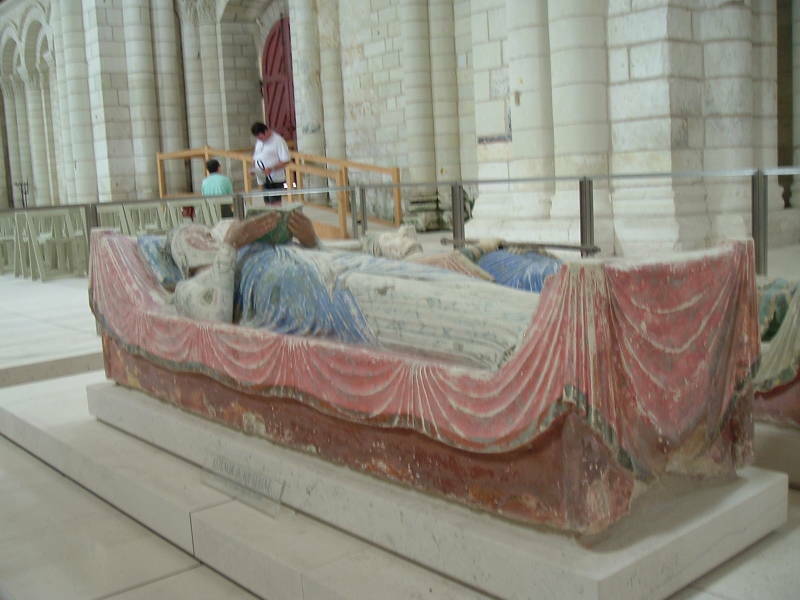 When she died in 1204, she was also buried here at Fontevraud. Eleanor and Henry's son John was crowned King of England in 1199. He married Isabella of Angoulême in 1200. He was not loved, with the barons forcing him to sign the Magna Carta in 1215 and civil war breaking out soon afterward. Supporters of his son Henry III proclaimed Henry the legitimate King, making him the only king since the Norman Invasion to be crowned while his father was still alive. John died of dysentery while on a military campaign in western England in late 1216, and Henry's supporters were victorious. Historians can come up with positive attributes such as "hard-working administrator", but John was petty and cruel and had reason to be the villain of the Robin Hood legends. In 1254, Henry III organized the transfer of the remains of his mother, Isabella of Angoulême, from Angoumois to Fontevraud for burial. Meanwhile, John was buried in Worcester Cathedral. 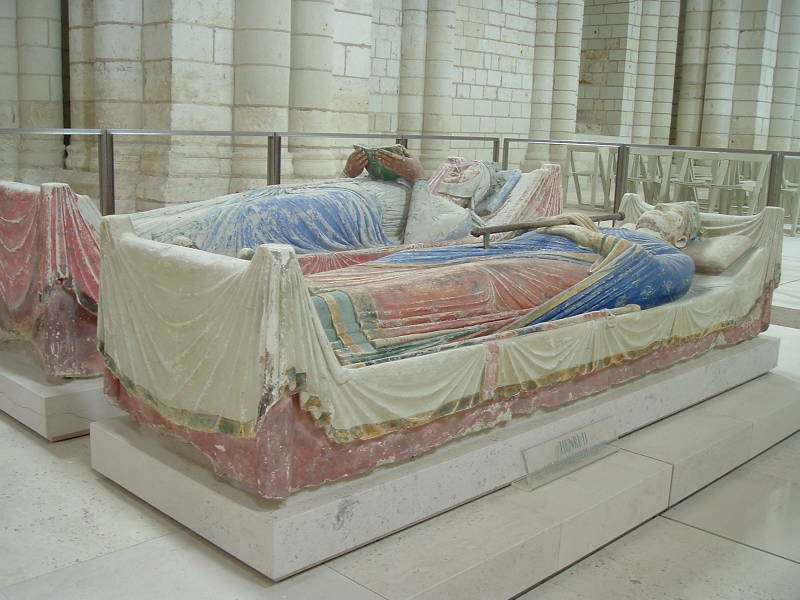 Tombs of Richard Lionheart and Isabella of Angoulême. Richard was the son of Henry and Eleanor, Isabella was the wife of Richard's brother John. The end of the Plantagenet dynasty hurt the abbey. Then the Hundred Years War led to even further declines. It lost about 60% of its land rents. The abbey itself wasn't raided, but many surrounding areas normally supporting the abbey were repeatedly devastated in 1357, 1369, and 1380. Things began to improve through the late 1400s. Then there were ups and downs, nothing like the prosperous times under the Plantagenets, but further construction projects continued. Small chapel in the πρεσβυτέριος or presbytery, or the chancel. The French Revolution changed everything. On 2 November 1789 all church property was declared national property. There were about a hundred religious and lay members living here, and the community continued for several months. In April 1790 most of the remaining religious community left. In 1804 Napoleon signed a decree converting several former religious institutions including this abbey and Mont Saint-Michel into prisons. The Revolution marked the real starting point of the French penitentiary system, with the conversion of the château of Saumur, Fontevraud and Mont Saint-Michel and many more monasteries, and other historic structures. Prison population tripled under Napoleon's rule. By the early 21st century the incarceration rate in France had increased to 103 per 100,000, one-seventh the 693 per 100,000 rate in the United States. The main structures of most of the abbey buildings were preserved, although there were heavy modifications. The nave of the main church had two floor levels added in order to house prisoners. The many windows and doors were blocked to make escape more difficult. The first prisoners arrived in 1812. The prison was designed to accommodate 1,000 inmates, but by 1830 up to 2,000 were confined here. Prisoners built workshops and factories. These, along with guard positions, provided work for the local people. In the 1950s and early 1960s the prison population here was down to the 600s, back up to 818 near the end. Most of the prisoners were transferred out in 1963, except for 40 of the more trusted ones who were kept there to maintain the green areas and work on the demolition of the added prison-specific structures. In 1985 the last prisoners were finally transferred out. 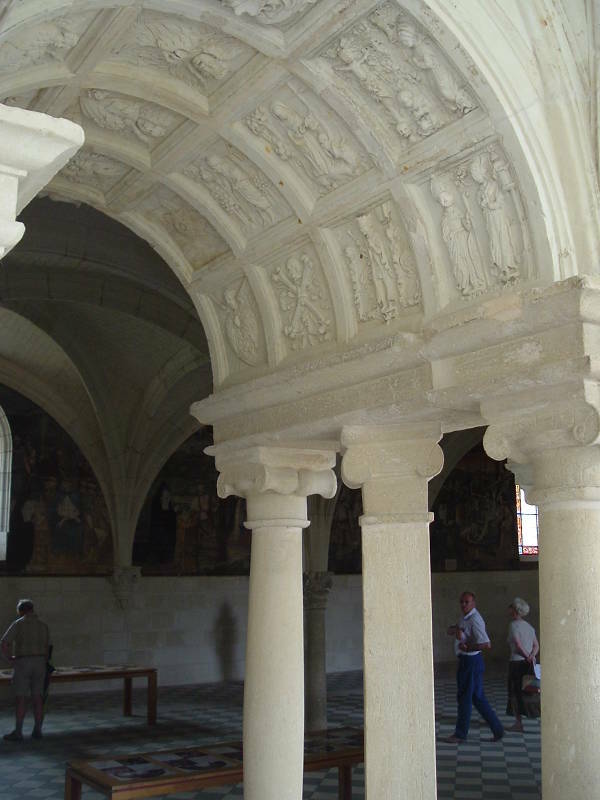 The cloister, now restored, is about 60 meters on a side. The main kitchen has a distinctive roof with several chimneys. 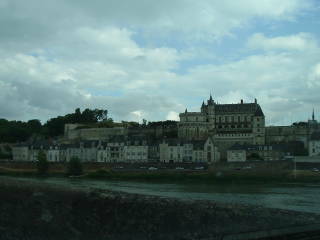 Now we'll continue to Chinon, where Joan of Arc met the French Dauphin.